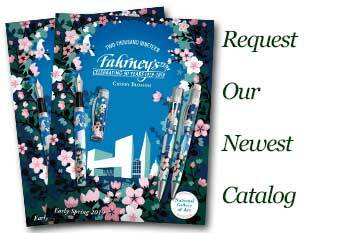 Order your Fahrney's Exclusive 2018 Cherry Blossom Fountain Pen today from FahrneysPens.com. Fine Pens, Refills & Luxurious Gifts – great prices & fast shipping. Released each year during the Cherry Blossom festival in our home base in Washington, DC, Fahrney’s exclusive 2018 pens are an original design created by Retro 51 featuring the delicate blossoms and the U.S. Treasury Building. Our 12th Special Edition Cherry Blossom collection recognizes the historical and architectural significance of the Treasury building (a National Historic Landmark) and its impact on the design of government buildings in the 1800s. Our 2018 design started with a glittering black barrel to create a night scene showing the cherry blossoms reflected in the moonlight. A silhouette of a bald eagle flies in the sky, a nod to the bird featured on the Treasury Department’s flag. The pen features the Treasury Building’s North Wing, completed in 1869. The pen’s stunning design is meticulously created using multiple layers of screen-printed patterns on the solid metal barrel and cap. The Tornado-style pens have antique silver-colored accents. The limited production series includes a fountain pen with stainless steel nib, twist-top rollerball/ball pen, and a 1.15mm pencil with eraser – all presented in a custom-designed, tube-shaped box. Use your new pens to record budding thoughts in Fahrney’s own 2018 Cherry Blossom companion journal.